In this article, you’ll discover new research insights that reveal what content performs best on LinkedIn, which industries use the platform today, and how marketers are planning to move forward. 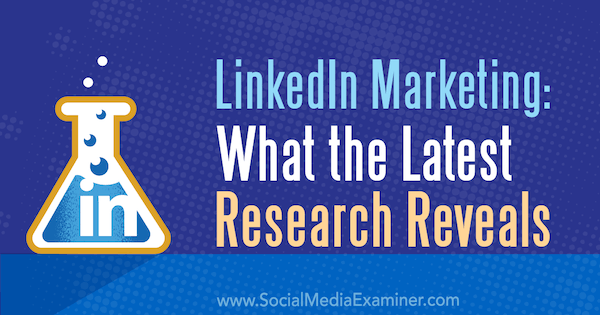 LinkedIn Marketing: What the Latest Research Reveals by Michelle Krasniak on Social Media Examiner. It’s well-known that visual content performs best on social media in general. But just like there’s no one-size-fits-all approach to the types of content your audience likes, there isn’t a single answer to the question, “What types of content perform best on social media?” The universe is full of outliers, and in this case, LinkedIn is in its own orbit. BuzzSumo analyzed 228,000 natively published LinkedIn articles and 136,000 shared articles from other websites that were posted between 2012 and 2017. Data showed that in 2014, users posted approximately 1,000 natively published articles (blog-length content) per month. In 2015, that number skyrocketed to 80,000, and 2016 saw 130,000 articles posted each month. In addition to the impressive year-over-year growth of the number of articles published, BuzzSumo learned that the most shared pieces of content were long-form articles of 1,000 to 3,000 words, even though most posts were fewer than 1,000 words. Out of the 80,884 posts they studied, only 13,886 (17%) were 1,000 words or more. BuzzSumo also discovered the subject matter of the best-performing articles centered around a set of specialized “5Ps”: personal, professional, practical, portraying (a path for change), and point (towards past experiences). In fact, LinkedIn was the primary platform for these topics. This finding lends itself to the fact that LinkedIn is a business networking site so more serious content fits better there than on Facebook, for example. According to BuzzSumo’s research, articles between 1,000 and 3,000 words were shared the most on LinkedIn. 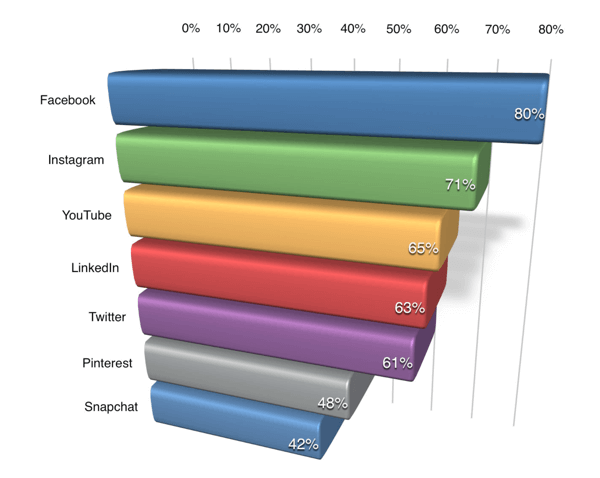 What does this mean for social media marketing teams and their visual content? If you’re planning on ramping up your presence on LinkedIn, you should adjust your content strategy to include long-form content. These pieces are often specialized (based on the subject matter) and personalized. While it’s not unheard of, chances are your average professional content creator won’t have enough insights from personal experience to write about. That translates to the involvement of other individuals, which often adds time and cost to the mix. While LinkedIn doesn’t release the number of users with specific account types (e.g., recruiter, job seeker), a search for the terms “recruiter,” “recruiting,” “recruitment,” “sourcer,” “sourcing,” “talent,” “executive search,” and “staffing” produced more than 9.9 million results, which is 2% of the total number of accounts. 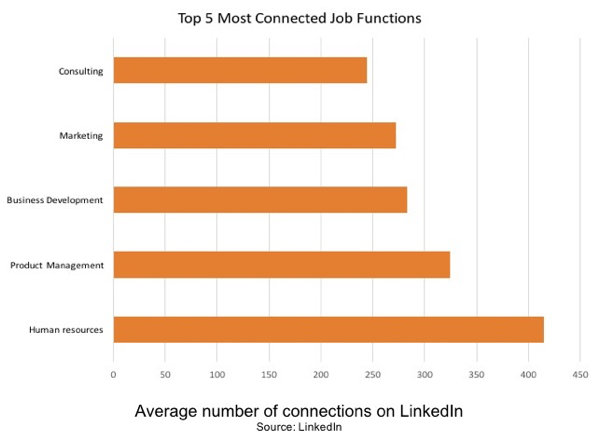 Human resources is the most connected job function on LinkedIn. There were 3.98 million users using those search terms in their profiles in the U.S. alone. So out of the 138 million total U.S. account holders, 7% utilized those recruitment-related terms. Furthermore, LinkedIn boasts over 10 million job listings. LinkedIn makes their money through talent solutions, marketing solutions, and premium subscriptions. Their Q3 2016 earnings report states that talent solutions are responsible for nearly $623 million of the total $960 million in revenue (or about 65%). Marketing solutions account for a little over $175 million (18%) and premium subscriptions brought in nearly $162 million (17%). Because talent solutions make up more than two-thirds of their revenue, LinkedIn will probably put most of their focus on cultivating that portion of the business. What this could mean for marketers is that LinkedIn likely won’t put much money toward research and development of marketing and advertising platforms as robust as those found on other social networks. While advertisers won’t be completely ignored, there could be limitations in what products and services they can choose from. And if they’re finding the available options aren’t working, they’ll essentially have no choice but to put their time and money elsewhere (eventually). 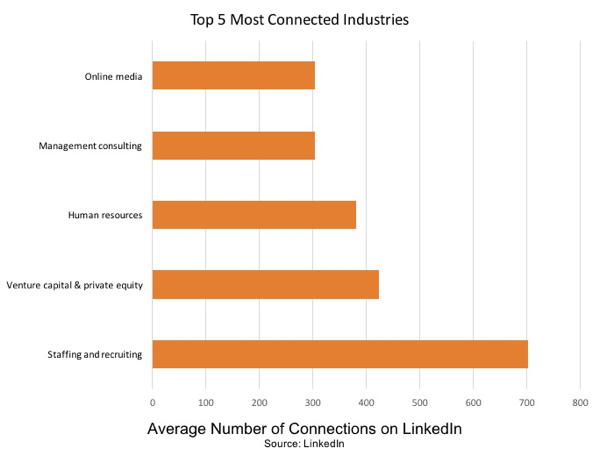 Staffing and recruiting is the most connected industry on LinkedIn. While the above is merely a prediction, it makes the best economic sense for LinkedIn. The recruiting services are their cash cow and will always receive most of their attention. Because of this, you should play the long game when investing in marketing on LinkedIn. Ask yourself questions like, Are the current marketing solutions offered sufficient for you? Will any limitations in targeting be a problem, especially if the capability isn’t improved anytime soon? Our 2017 Social Media Marketing Industry Report found that of the more than 5,700 marketers surveyed, 56% utilize LinkedIn as part of their social media marketing strategy, down from 67% in 2016. As expected, LinkedIn use is still heavily skewed towards B2B, with 81% of B2B marketers and 44% of B2C marketers reporting they use it. It’s interesting to note that social media marketers don’t seem to be loyal to any one social network when Facebook (62%) is taken out of the equation. In fact, only 16% of marketers who use LinkedIn say it’s their most important platform, while Twitter comes in at 9% and Instagram at 7%. However, because Facebook can never be taken out of the equation, it’s still huge competition for LinkedIn, even in the B2B market. In fact, for the first time in the history of our study, Facebook (37% to 43%) has surpassed LinkedIn (40% to 37%) as the platform of choice for B2B marketers. 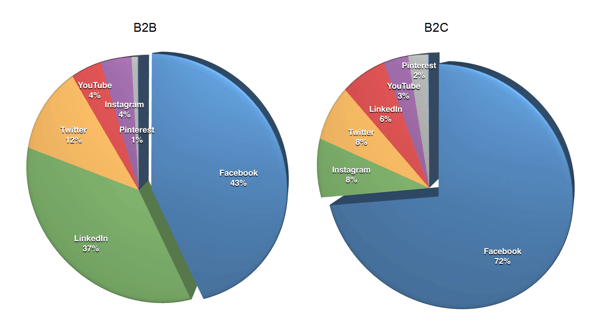 Facebook has passed LinkedIn as the most important platform for B2B marketers. It may seem like LinkedIn is fading away, but it’s not, according to our report. Nearly one-third (31%) of marketers have increased their LinkedIn activity over the last year and are now posting an average of four times a day. About one-third (31%) of marketers have increased their LinkedIn posting frequency over the last 12 months. Fifty-five percent of respondents say they plan on increasing their LinkedIn posting activities over the next 12 months. Sixty-eight percent of B2B marketers and 48% of B2C marketers plan on increasing their posting frequency. 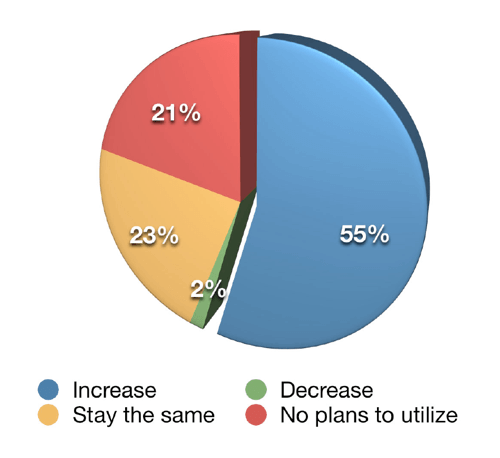 Only 2% plan on decreasing their activity. 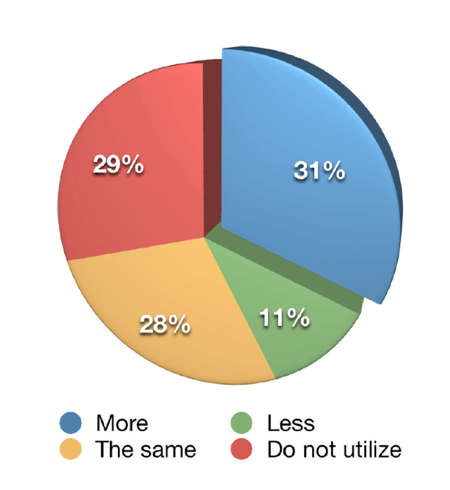 Fifty-five percent of respondents plan on increasing their LinkedIn posting frequency over the next 12 months. There’s still plenty of marketing interest in the platform. More than two-thirds (63%) of marketers who took our survey said they wanted to learn more about LinkedIn, and not surprisingly, 74% of those are B2B marketers. Sixty-three percent of B2B marketers are interested in learning about LinkedIn. Our survey shows that social media marketers do still have an interest in LinkedIn. It makes you wonder if that’s because they think it would be useful for them, or they’re unsure whether it would be useful or not. People know it’s a business networking site, but since it’s lumped in with social networking sites, there may be some confusion about content and behavioral expectations. Then there’s the fact that it’s common knowledge that recruiters and job seekers use the site heavily. It’s not surprising that many marketers want to learn more about how to best leverage LinkedIn. What do you think? Will these insights affect your approach to LinkedIn marketing? Does your LinkedIn content strategy include long-form content? Please share your thoughts in the comments below.